Speedier convalescence, return to activity & improved health related quality of life (HrQoL) are indices of patient reported outcomes in laparoscopic cholecystectomy (LC). Improving patient reported outcomes by minimising multi-factorial post-operative pain & fatigue in LC demand a multi-pronged approach. Yoga improves HrQoL in many chronic fatigue & stress related inflammatory disorders. 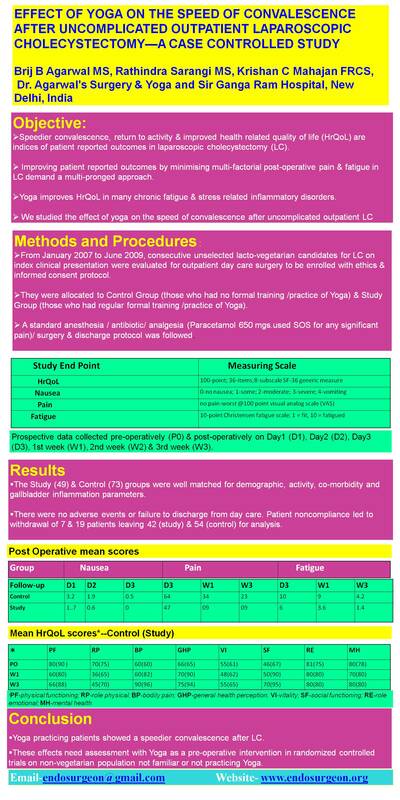 We studied the effect of yoga on the speed of convalescence after uncomplicated outpatient LC. From January 2007 to June 2009, consecutive unselected lacto-vegetarian candidates for LC on index clinical presentation were evaluated for outpatient day care surgery to be enrolled with ethics & informed consent protocol. They were allocated to Control Group (those who had no formal training /practice of Yoga) & Study Group (those who had regular formal training /practice of Yoga). A standard anesthesia / antibiotic/ analgesia (Paracetamol 650 mgs.used SOS for any significant pain)/ surgery & discharge protocol was followed. The Study (49) & Control (73) groups were well matched for demographic, activity, co-morbidity and gallbladder inflammation parameters. There were no adverse events or failure to discharge from day care. Patient noncompliance led to withdrawal of 7 & 19 patients leaving 42 (study) & 54 (control) for analysis. Yoga practicing patients showed a speedier convalescence after LC. These effects need assessment with Yoga as a pre-operative intervention in randomized controlled trials on non-vegetarian population not familiar or not practicing Yoga.